Lately, my baskets of fruits and veggies from the Bountiful Basket Co-Op have been cucumber a plenty. The overflow of cucumber lead me to this delish find. It was so delectable that VegKid literally licked the plate clean. 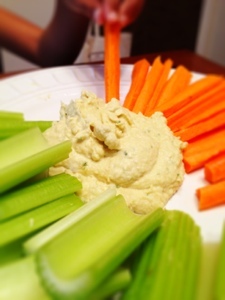 Next time you have a bounty of cucumber toss it in your hummus. You won't be sorry. The addition of cucumber makes this guy a little thinner than most hummus, but that makes it perfect for scooping up with carrots, celery sticks, or more cucumbers. Toss all ingredients in to your blender and blend on high until smooth. 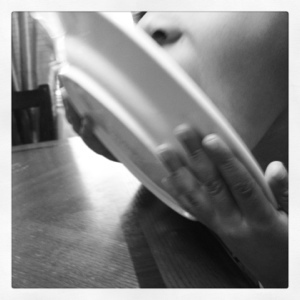 Yep, that's VegKid licking the plate. ooh..I am going to try this..I love Hummus!